Every 80s stud knows that the key to being one rad dude is to keep that bod in great shape. That means following three strict rules: eating lean, being a workout machine and dressing in green! The first rule means that you got to get that diet into high gear. That means eating your vegetables and taking your vitamins every day you hunk. The second part means that you’re going to make a few stops to the gym. You need to get physical! Hop onto that aerobics mat. Push it to the limit. Walk along the razor’s edge, but don’t look down just keep your head or you’ll be finished… you know, like the song says to do. The third rule, well, that’s where we give you a hand. 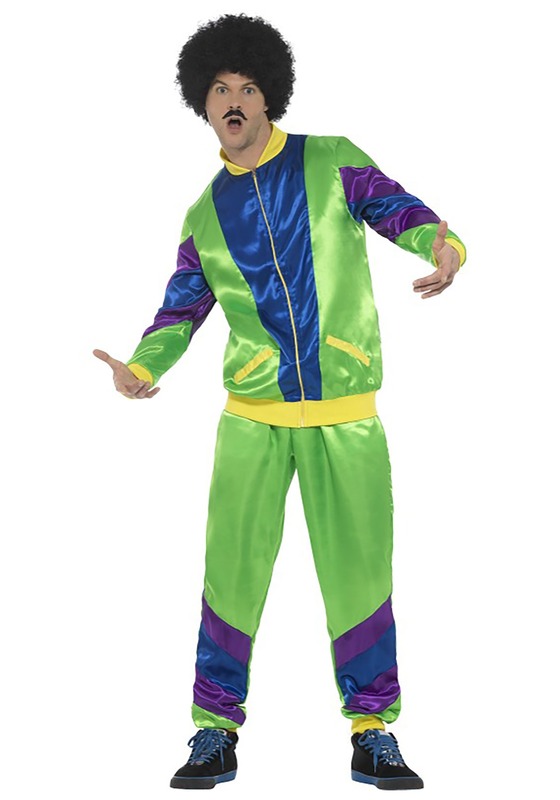 This 80s tracksuit costume is a godsend. Brilliant lime green covers the top and bottom of this track suit set, making you look like the kind of manly man that knows his place in the world. The blue and purple accents also help you stand out in a crowd full of squares. It truly is the ultimate workout gear of the 80’s cool guy. Of course, you’re going to have to grow a wicked mustache and the afro to complete the look, but you’re up to the challenge right? (If not, we can hook you up with some fake facial hair and a corresponding wig to put your look into 80’s overdrive). Now, go grab your cassette player. It’s time to shine.